Remaining no.1 at the box office two weekends in row, “Straight Outta Compton” highlights how reality rap group NWA revolutionized Hip Hop culture with its music and fashion, and served as a voice for the injustices that took place in Los Angeles, Ca. Named after the group’s classic album, the film couldn’t have been released at a better time, because the same social injustices NWA rapped about in the late 80’s and early 90’s are still problematic in 2015. In the 2010 ESPN 30 for 30 “Straight Outta L.A.” former NWA member Ice Cube talks about how LA Hip Hop changed the rules of the rap game in the same way the LA Raiders changed the rules of football. During the Raiders’ 13 years in LA, the team was known for being the ruthless “bad boys” of football and NWA identified with that same ruthless, bad boy attitude in rap, which is why group members were always seen sporting black or wearing Raider gear. It was all a part of their identity. But, like any biopic, not everyone was happy with the finished product of the “Straight Out of Compton” film. E.B. Wright, daughter of late NWA member Eazy-E, asserts pivotal moments were omitted from the film and it doesn’t accurately show matters in regards to her father’s life. 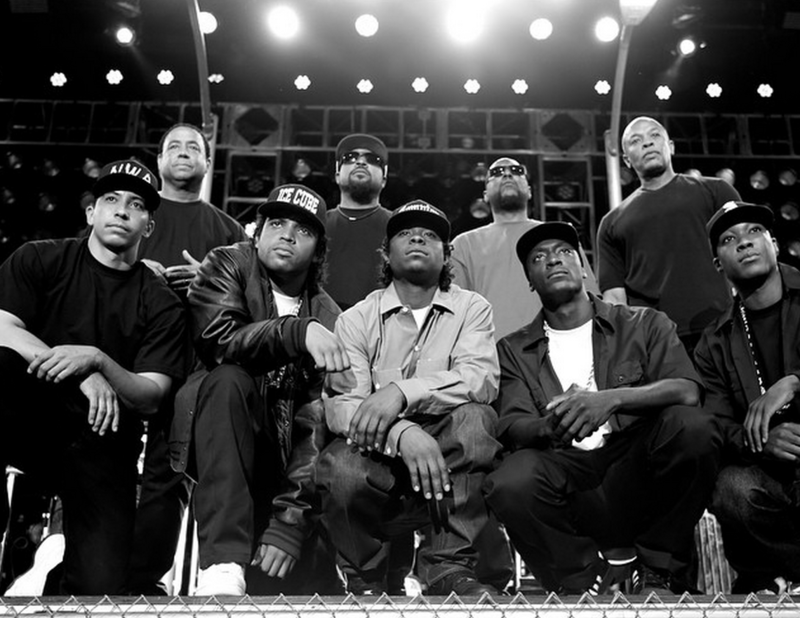 NWA member MC Ren took to Twitter praising the film, but also referencing that it downplayed his contributions to the group. And the most opposing view of them all was that of former rapper and television personality Denise “Dee” Barnes. She also discusses pivotal moments being omitted from the film, stating that successful female rappers such as Tairrie B and JJ Fad – whose success paved the way for the “Straight Out of Compton” album and who were an integral part of the Ruthless Records label – were erased from the story line. She also expresses her mixed emotions when her physical assault by Dr. Dre wasn’t included in the film. However, the assault scene was originally apart of the film according to the LA Times. But director F. Gary Gray said they couldn’t fit everything into the movie and he only wanted to focus on the stories that served the narrative. Barnes does make some interesting points. For example, if Tairrie B and JJ Fad were integral parts of Ruthless Records, they could’ve been briefly included in the film, just as Tupac and Snoop Dogg’s characters were briefly added to contribute to the success of Death Row Records (the label Dr. Dre co-founded with record producer and music executive Suge Knight after parting ways with NWA and Ruthless Records). It was an opportunity for O’shea Jackson Jr., Jason Mitchell, Aldis Hodge, Corey Hawkins, Neil Brown Jr., and many other black actors to play larger roles than before and set themselves up for future roles, which are hard to come by for black actors in mainstream Hollywood (due to the small window for black actors, there’s a tendency to see directors using the same actors in their films. Too often artists in the music industry have been and are manipulated and ripped off by managers and record labels. NWA manager Jerry Heller wasn’t financially savvy with the group’s money, showed favoritism to Eazy-E and was one of the primary factors leading to the group’s demise. TV One’s “Unsung” displays a similar situation happening to 1970’s American Soul and R&B group Rose Royce. Record label owner Norman Whitfield showed favoritism towards singer Gwen Dickey, and egos and money woes led to the group’s break up. It’s important for artists to hire attorneys to look over their contracts before signing anything, as well as looking it over themselves and having more control over their business. At the end of the day, money, egos or manipulative people should never come between true friendships. Chase your dreams and stand up for what you believe in. Dr. Dre had a vision and made Eazy-E a believer to invest in it. What if Dre had listened to his mother and club owner Alonzo? What If Eazy would’ve never had the courage to get behind the mic because he wasn’t a “rapper?” Although he had a lot to do with the group’s demise, what if Jerry Heller didn’t believe in NWA? No matter the dream, you have to take risks to win. And although NWA members had an unconventional way of speaking about social issues, it was there reality and a lot of people could relate. You’ll always be respected for authenticity. I’m convinced none of us believe in Christ the way we claim to. What does our demeanor or mentality reflect? We will go to a job we don’t like because it’s secure and we know we have a steady paycheck coming in or settle for a relationship that’s not any good for us because we just want to be able to say we have somebody or we don’t want to be lonely. But isn’t Christianity an experience based on faith? So why as Christians are we afraid to take risks, chase our dreams and make sacrifices? God calls us to be strong and courageous not timid and comfortable. We think things are too good to be true or too big to conquer; however, we believe in & serve a God we cannot see. Isn’t that too good to be true? God is too good but He’s still true. It all boils down to a lack of belief in ourselves. We contradict our faith. As Christians, we are filled with the Holy Spirit. So when we don’t believe in ourselves, we can’t possibly believe in the Trinity. The Trinity has not limits and if it lives inside of us, we have no limits. This proves that we’re not all in for Christ. We’re just flirting with Christ instead of being committed to Him. Most of us are dead when we should be alive in Christ, living from the inside out, allowing the Holy Spirit to flow out into the atmosphere and touch those around us. We must release the Holy Spirit and allow our lights to shine and honor our savior in doing so. There’s a reason the Bible tells us to seek Ye first the kingdom of God; this is because only He can give us vision. Philippians 3:13-14 says “Forgetting what is behind, I press on toward the goal to win the prize for which I have been called heavenward in Jesus Christ.” The prize is our calling or purpose in life. However, we can only come to know our calling by coming to know Christ. There’s a quote by Mark Twain that says, “the two most important days in your life are the day you’re born & the day you find out why.” I believe the two most important days are the day we’re born again & the day we realize our God-given assignment. How can we know our true “why” if we don’t know Christ? We all struggle and go through storms. The sun always shines after the storm, but it’s how we allow the storm to affect us that determines our outcome. If we know the sun is going to shine again, why don’t we embrace the storm? It will either make us bitter or make us better. If we’re bitter we go backwards, if we’re better we go forward. Why permanently struggle to stay the same when we can temporarily struggle for change? Is not the latter worth much more? All temporary things shall pass, while permanent things are for sure to last. Don’t avoid the struggle, because the only way out is to go through it. The struggle is real. Just don’t struggle for nothing and settle for less, struggle for something and gain more. When you’re on God’s team, every season is a winning season. In order to have a winning season, we must have more wins than losses. Wins are blessings & losses are tribulations. I believe most of us can agree that we’ve experienced more blessings than tribulations – meaning we have won more than we’ve lost. A tribulation is only temporary and is usually a blessing in disguise. So, even when we lose, we’re still winning. As long as we’re on God’s team, we can’t lose because we are Eternal winners. Every season is our season. So, why not play big if we know we can’t lose? I recently watched the 2014 independent film “Whiplash.” I recommend everyone with a passion or a dream to watch this film, especially athletes. The main character, Andrew, aspires to be the greatest drummer ever, but he soon learns there’s a price to pay to be the greatest of all time. After enrolling at the best conservatory music school in the country, he meets a band instructor who pushes him past his mental and physical limits with insane measures. Day and night, Andrew beats his drums to be able to play at a faster tempo than he’s ever played before. He plays until his hands cramp and his knuckles bleed. He tells his girlfriend he only has time for his dream and breaks up with her. His family members laugh at him because they consider being a drummer a hobby, not a profession. Although the Shaffer Jazz Orchestra instructor, Fletcher, mentally and physically abuses Andrew – yells and curses him out, throws chairs at his head, slaps him, replaces him with a less-talented drummer and makes him cry – Andrew always shows up to practice and works hard to get better. He understands that some sacrifices have to be made before he can reach his goal. Andrew makes the biggest sacrifice of his life when the time for his first live performance arrives. He leaves his music list and has about 10 minutes to leave and come back, or another drummer will play in place of him. After retrieving his music notebook, Andrew speeds to get back to the show and finds himself blindsided by another car. With blood running from his head and a severe case of whiplash, Andrew runs the rest of the way to the performance. He walks in with blood everywhere and sits at his drum set. Other band members and and the instructor look surprised, but it’s nothing they can do because it’s show time. Andrew struggles to keep up with the tempo of the band and hurts the performance. After the show, Fletcher tells him that he is no longer a part of the orchestra. Some time later, Andrew learns a former Shaffer Orchestra member commits suicide due to abuse he endures from Fletcher. Andrew gives his testimony so no one else will have to endure what he and others have, and Fletcher is fired. Afterwards, Andrew leaves music school, hangs up his drumsticks and gets a regular job. He runs into Fletcher at a Jazz lounge, they talk – Andrew assumes Fletcher doesn’t know he’s the one who assists in his firing – and Fletcher asks him to perform with his band at a show. Andrew is hesitant at first, but Fletcher assures him they will play music he already knows. Andrew accepts and before the performance starts, Fletcher walks up to Andrew sitting at the drums and lets him know he’s aware he assisted in his firing. Fletcher quickly starts the performance and calls out a song Andrew doesn’t know. Andrew tries to find the beat but is off and embarrassed. He leaves the stage and his dad is there to comfort him and encourages him to leave. Andrew turns around and walks back to the drums and sits. He calls out a song and tells the rest of the band and Fletcher he will cue them when he is ready. Andrew plays the drums faster and better than he’s ever played them. In that moment, Fletcher realizes that Andrew has what it takes to be the greatest of all time. The moral of this story is fight for what you want or you’ll have what you don’t want. After Fletcher sabotages him, Andrew could’ve quit and walked away but then Fletcher would’ve won. Because of Andrews will to win, he and Fletcher can win as the best drummer and best orchestra instructor, respectively. Whatever you go through, don’t let it piss you off, but let it piss you on to greatness. Never quit before you’re breakthrough, just keep going hard until you get whiplash! There’s a reason the Bible tells us to seek Ye first the kingdom of God; this is because only He can give us vision. Philippians 3:13-14 says “Forgetting what is behind, I press on toward the goal to win the prize for which I have been called Heavenward in Jesus Christ.” The prize is our calling or purpose in life. However, we can only come to know our calling by coming to know Christ. There’s a quote by Mark Twain that says, “the two most important days in your life are the day you’re born & the day you find out why.” I believe the two most important days are the day we’re born again & the day we realize our God given assignment. How can we know our true ‘why’ if we don’t know Christ? We all struggle and go through storms. And the sun always shines after the storm, but it’s how we allow the storm to affect us that determines our outcome. If we know the sun is going to shine again, why don’t we embrace the storm? Because the storm will either make us bitter or make us better. If we’re bitter we go backwards, if we’re better we go forward. Why permanently struggle to stay the same when we can temporarily struggle for change? Is not the latter worth much more? All temporary things shall pass, while permanent things are for sure to last. Don’t avoid the struggle, because the only way out is to go through it. The struggle is real. Just don’t struggle for nothing and settle for less, struggle for something and gain more.